Vietnam is up there with our all time favorite places in the world for its sheer beauty and inimitable traditions. 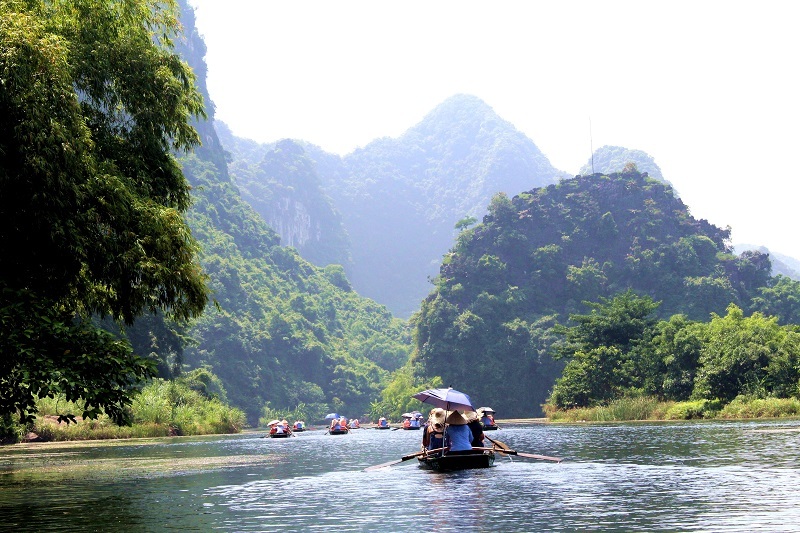 Vietnam has up to 2.360 rivers with a total length of about 41.900 km. These form a dense network covering the whole country. Among them, a lot of rivers went through the years, witnessed many ups and downs of the Vietnam history. Now, in addition to the memories of heroic history, it is also the river that brings out the outstanding beauty of Vietnam tourism. Those conquering the Ma Pi Leng Pass in the northern upland province of Ha Giang shall be amazed by a river like a silky fillet in fog as it brings them a pleasant sensation of a naturally romantic masterpiece. That river is called Nho Que - the river at foot of Ma Pi Leng Pass. The river is concerned as the mysterious of nature. A trip to Ma Pi Leng may be a wonderful way to discover the life in Northern Vietnam where life is still difficult and harsh. 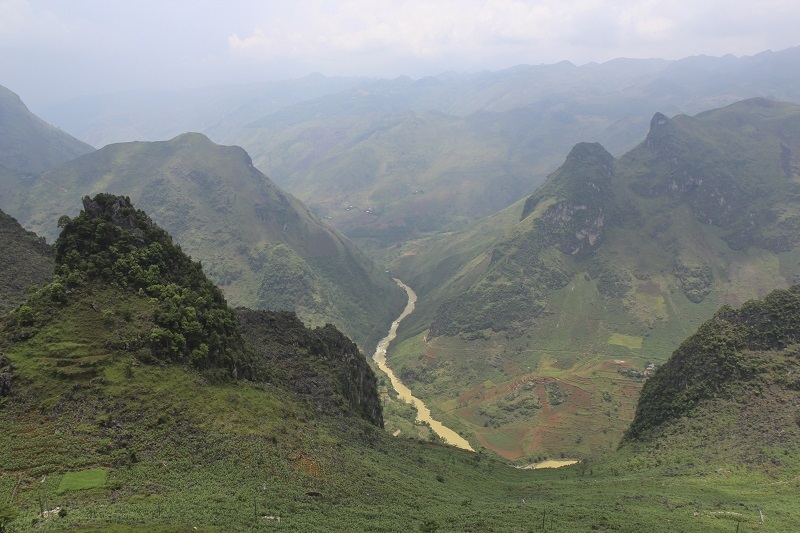 Ha Giang is one of the six poorest provinces of Vietnam but owns a lot of marvelous natural landscapes. Ma Pi Leng is one of the four highest passes in the country. It is not long, only 20km, but dangerous with steep cliffs and deep mountainous slopes. Along with Ma Pi Leng Pass, Nho Que river is a legend, described in many poems and songs, and has become a symbol of Ha Giang. From the top of Ma Pi Leng, you can see Nho Que look like a blue thread thrown from the sky. The combination of the mighty Ma Pi Leng and the charming Nho Que is an unique beauty of Ha Giang. Originated in Yunnan of China, the length of the river in Vietnam is 46km; at the average altitude of 1,200m above sea level. Thanks to the advantage of upper area with quite slope, strong flow through rugged rock, it creates waterfall in the middle of the valley. 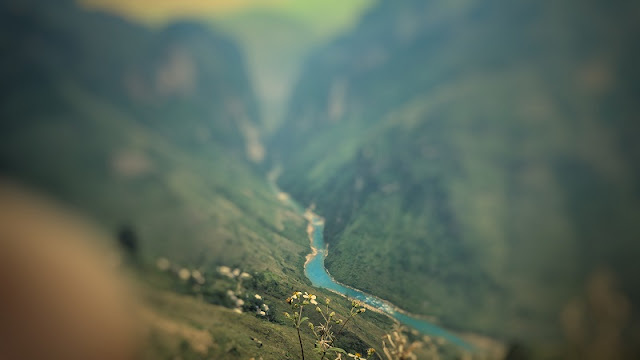 The river flows through Tu San canyon and Ma Pi Leng Pass of Meo Vac District. Two sides are high cliffs forming a deep and narrow canyon with the murmur of Nho Que river flowing beneath brings an indescribable feeling, rejoices with immersing large space of sky and mountains. Nho Que brings vital source of water for the whole plateau of Dong Van. There are 17 ethnic minorities who call the plateau home live on cultivating rice along the basins of the Nho Que River and corn on the rocky mountain slopes. Life may be tough, but the local ethnic groups still keep their century-old traditions. Ngo Dong River is a small river in Ninh Hai Commune, Hoa Lu district, Ninh Binh province. Ngo Dong River flows from the lagoon valley in the heart of Trang An landscape complex, through the cliffs and rice paddies and then flows into Vac River system near Vung Tram Bridge. Ngo Dong River - the name itself brings a very romantic sentiment. Ngo Dong River meanders through a rural landscape, passing verdant rice paddies and jagged limestone formations. Ngo Dong is the only way heading to Tam Coc - “ Ha Long Bay on land”. From Tam Coc wharf in village of Van Lam, it's a two-hour trip along the river to the three limestone caves that give Tam Coc its name. Rowing boat on the river in the harvest time, the golden color of rice fields surely makes an unforgettable memory in tourists’ mind. Mentioning Da Nang, tourists can not forget the poetic Han river and its bridge - the first swing one in Vietnam. The Han River flows through the central area of Da Nang and it has played an important part in the development of the city’s tourism sector. You have to see it to believe how Da Nang transforms to a city of light during the evening. As the night sets in, the colorful lights from skyscrapers, the bridges, restaurants and bars bring a completely different vibe to the city. Four colorful bridges cross the river and each one has a different silhouette, recently a large Sun-wheel was opened bringing even more light. All this makes Da Nang more vivid than ever. Just start your night with a stroll along the river banks where you’ll see both tourists and local people enjoy the cooler temperatures. 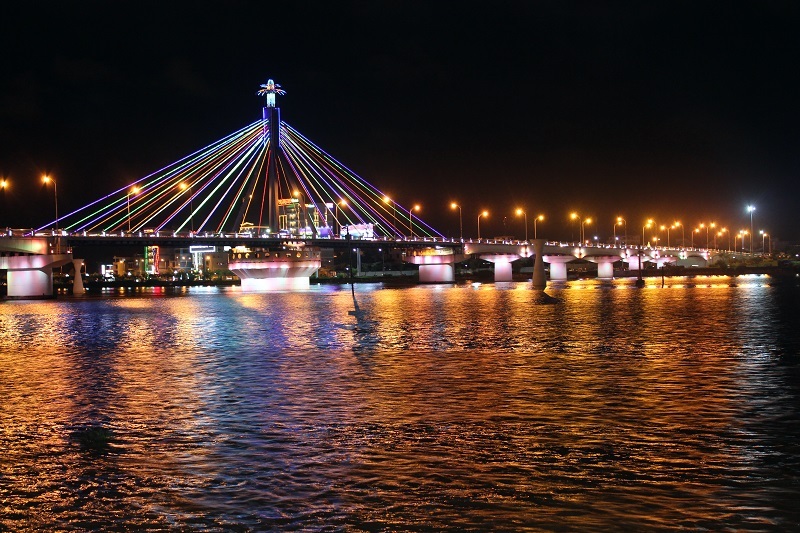 All bridges crossing the Han River, which are illuminated by artistic LED lights, create a serene portrait of a city at night. Tourists can tour the award-winning Dragon Bridge in the shape of a dragon and witness it spit fire on Saturday and Sunday nights. Cruising along the Han River at night or fishing on the rocks of Ngoc Islet off Hai Van Pass are becoming popular forms of summer entertainment in Da Nang. 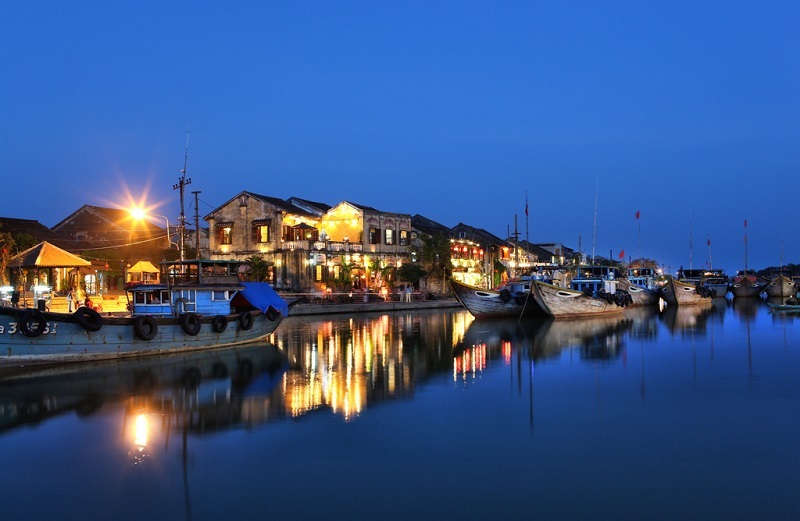 Hoai River is a branch of the Thu Bon River flowing through the ancient town of Hoian. The small river running through the ancient town not only brings cool water steams but also sets up a stunning and poetic landscape. For locals and tourists, this river is an inseparable symbol of the ancient town. In daytime, the river witnesses the daily life of locals and trading affairs as thousands of boats run along the stream and break the shades of clouds and trees over the water surface. When night comes, the river becomes a sparkling affair with colorful lanterns hanging over the nearby streets and on the boats. A day on the river usually starts very early in the morning because many tourists wish to see the sunrise on the river. At any time of the day, you can see small boats on the river. If you are ever lucky enough to come across the Hoai River in Hoi An you should then enjoy the pleasure of floating down the river of remembrance. Participating in a boat trip, tourists can admire the beauty of Hoi An from water and listen to the interesting stories from ferryman. Also, many foreign tourists to the town now choose the bicycle tour from the river to Cua Dai Beach in order to admire the natural scenery as well as life of locals. From Cambodia, Mekong River is divided into two major tributaries: Tien river and Hau river. Because there are nine estuaries flowing into the East Sea, Mekong River flowing through Vietnam is also known as the Nine-Dragons River, meaning “nine tributaries of river”. 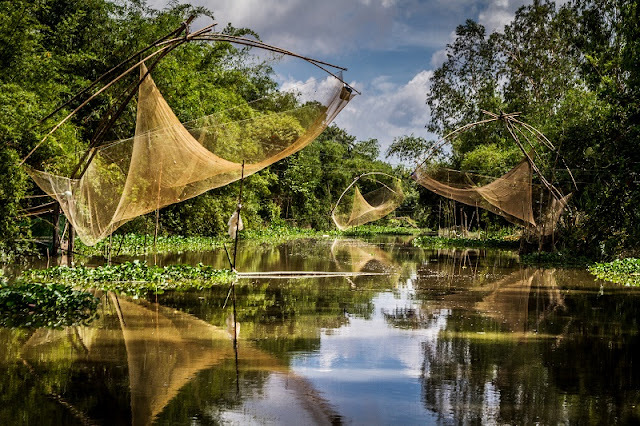 Every year, the number of tourists traveling to the Mekong Delta increases 50% compared to other destinations of the whole country. The tourist potential of Nine-Dragons River has contributed positively to the economic growth of the whole region, creating more jobs, increasing incomes for people, contributing to preserving and promoting traditional cultural values of the nation.